Facebook recently added the ability to livestream (live video) on Facebook, catching up to the explosive popularity of livestreaming apps like Periscope. While Facebook Live was recently only available for celebrities and then some early livestreaming adopters, it has now rolled out this feature to everyone with an iPhone in the US, and plans are that Facebook will roll this out to the rest of the world in the coming weeks. We can only predict that a version for Android will be coming soon as well. Now, the thing is that Facebook Live Video is available only for individual profiles and for verified pages. Verified pages receive those little round, blue checkmarks right next to their names. 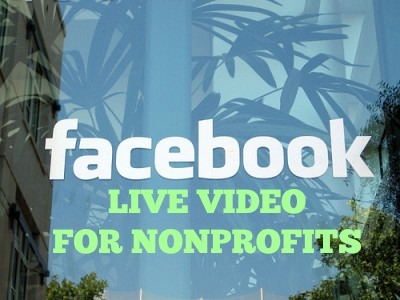 The most important thing to know is that even if your nonprofit has a Facebook page, it doesn’t mean you can start broadcasting. Your nonprofit’s Facebook page needs to be a verified page (at least for now), in order to use this new feature. Here’s how you can start the verification process for your organization’s page. You can only broadcast from your iPhone, not your PC or desktop. As you’ll see the live video icon will only appear on your Facebook status update bar on your mobile phone. As of this publishing date, Facebook Live Video is available only for US-based iPhone, but a little experimenting with the app over the weekend helped me figure out that your Android-user fans/friends, also get a Facebook notification when you go live and can watch, as do iOS users.